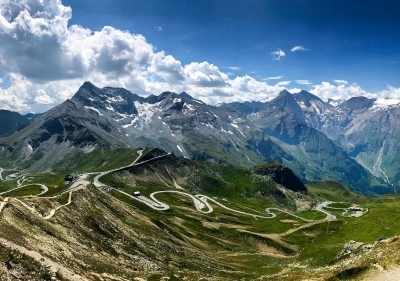 Großglockner High Alpine Road / Großglockner Hochalpenstraße is part of the Tentative list of Austria in order to qualify for inclusion in the World Heritage List. I'm a little surprised there isn't already a review of this site, as it's slated for inclusion in 2019 and also one of the most visited locations in Austria. The Road itself was constructed in the 1930s as a Depression-era employment for Austrians, and was one of the first automobile roads constructed specifically for tourism purposes. It passes through some incredible scenery, with magical views of the Austrian alps on both sides. We visited on a sunny Monday in August 2018, and it was very busy already! We drove from north to south, and opted to take both the Edelweissspitze and Kaiser-Franz-Josefs-Höhe side-tracks for even more scenic views. Note that the latter branch is the only place where you can actually see the eponymous Grossglockner mountain and accompanying glacier. Scattered along the length of the road is a series of 14 information points, all of which have some interesting info about various topics: construction, local flora or fauna and so on. Lots of parking, souvenir shops, bars/cafes and the like at many of these stops. Practical info: like the road, the toll is quite steep at 36 euros per car (less for motorbikes and free for bicycles I think). You can return the same day for free, and returning the following day is only an extra 12 euros. But we continued driving south, onwards toward the Dolomites!